Yesterday we went to Forbidden Planet and I bought myself a new manga, which was already in my wish list for some time, Princess Tutu. It is a very cute story, in the "magical girl" genre, almost as cute as Cardcaptor Sakura, really. The story is very childish, and about a girl called Ahiru who is a ballet student and falls in love with a boy who is also a dancer in the same school. 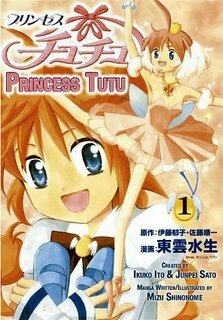 Mytho seems to be a bit too weird, and Ahiru's visit to a clothes shop (of sorts) opens the door of a magical world where she becomes Princess Tutu and no longer the clumsy little girl that she uses to be in the real world. As Tutu she will be able to rescue her beloved (or at least we hope!) from his apathetic and almost lifeless state. Why did I buy this? The artwork is very pretty, especially the characters expressions and movement. I am not expecting any depths story-wise. Purely for the fun of it!